This is about as close to Seattle as I remember seeing Walking Man Brewing visiting for a brewer’s night (I wouldn’t be surprised if I missed one, though). If you are in the Tacoma area, or you are up for a road trip, head out to the Red Hot tonight to say hello and try some of the five beers they’ll be bringing, including a cask of Shin Splint Imperial Red. If you have yet to visit the Red Hot, then this is the perfect chance to grab a hot dog and a pint while checking out one of the coolest bars in the Puget Sound area. Attention everyone in the Tacoma area. 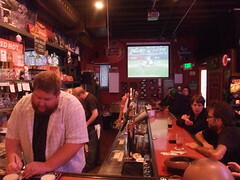 Wednesday the 24th of February, I will be at The Red Hot (http://www.redhottacoma.com/) for a Brewer’s Night. We are going to have 5 beers on: Homo Erectus, IPA, Black Cherry Stout, Pale Strider, and a cask-conditioned Shin Splint Imperial Red (YUM!). Come down and get a delicious hot dog and a pint and say hi. Cheers!